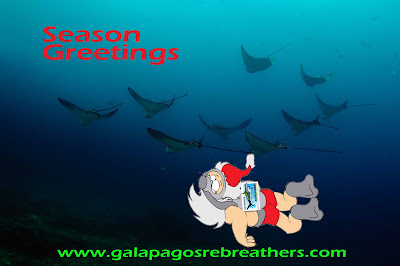 The Galapagos Rebreathers team would like to wish the readers of this blog happy holidays. Thank you for following our content, we hope to have more rebreather divers visiting us in 2012. For information of upcoming rebreathers trips and expeditions please do not hesitate to contact us. For anyone with an interest in rebreather technology and science, Rebreather Forum 3 (RF3) is an unmissable occasion. This is the perfect opportunity for you to get up to speed with current thinking in rebreather technology from the industry's foremost minds. This unique conference will address the major issues surrounding rebreather technology, and its application in sport diving. RF3 has two key objectives; an emphasis on safety and the much needed peer review of the state of the art. As a RF3 delegate you will be part of this important process. Galapagos Rebreathers will be represented by Jorge A. Mahauad who is attending the event. Jorge will be reporting live from there. For information and invitations contact him.